Audit Trails are a visual flow-chart showing every movement for a particular tank or batch from a particular point, logically linked in the order that they happened. This is a very clear and easy way to view and track the flow of production through to finished items. An audit trail gives you a visual picture of the operations carried out on a particular batch or tank. The following example shows the path of a particular fruit receival from crush, through blends and transfers, right through to packaging. From this chart you can see that it’s a simple process where some of the product has diverged into separate paths on operation 10. A written table containing the same information is also available for emailing, downloading or printing. Various options are provided allowing you to change the direction of the flowchart (e.g. 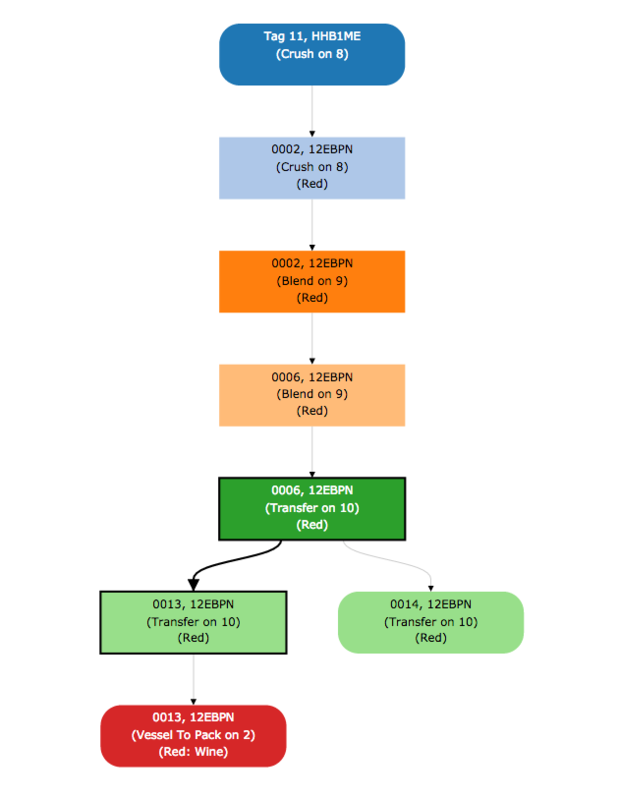 from most recent to least recent), draw the flowchart horizontally instead of vertically and changing how the flowchart is coloured. 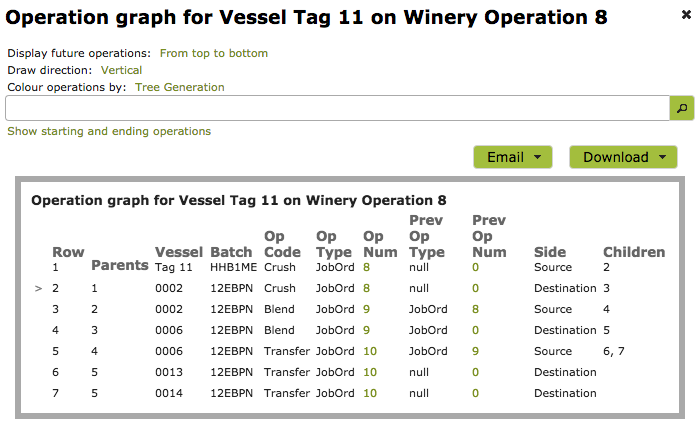 Clicking on a particular operation in the flowchart will bring up a menu, giving you an option to view the operation in question, search forwards or backwards or start a new graph from that position. Clicking also highlights the operation in question together with the operations preceding and following it in both the flowchart and the associated table. Audit trails are accessible from many places within the App, such as wherever fruit or bulk has entered or left the system with harvests, receivals or despatches. For example, the example outlined above can be accessed from the relevant Harvest Entry, Blending Operations, Transfer Operation or the Packaging Operation. Simply click on the cog next to the operation or relevant vessel to bring up the menu and click “Audit Forwards” or “Audit Backwards”. The relevant menu cogs from the Harvest Entry and the Transfer Operation are shown below. The audit trail is a great way to prove that data summarized on the “Where is it now?” tabs and the “Components” tabs can actually be traced forwards and backwards through the production process.